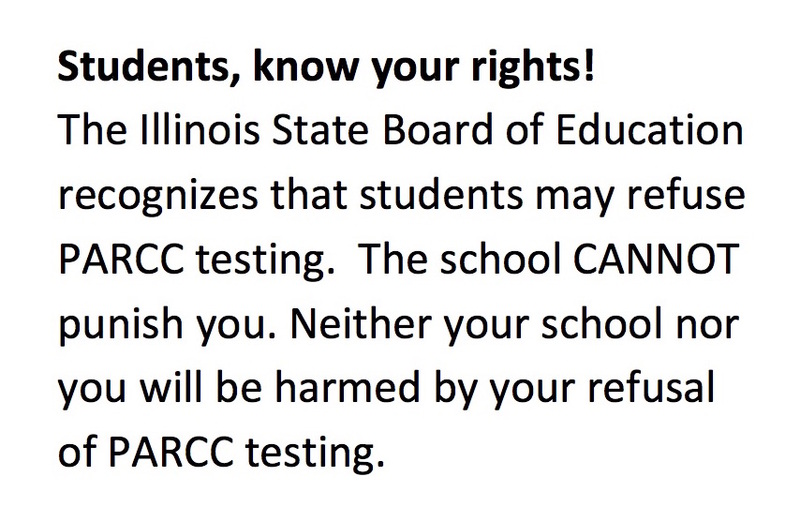 Your child can refuse PARCC testing. Although the IL State Board of Education does not recognize parental right to opt children out of testing, they have instructed districts that they can develop a policy for those students who refuse testing. Federal law requires all public schools in the United States to administer annual testing in reading and math to 3-8th grade and one year of high school. However, it does not say that every child, against their and their families wishes, must participate in the testing. My child will be refusing all PARCC testing. I expect school officials and employees to treat my child with kindness and respect and allow them to engage in alternative quiet activities during the test. Please let me know what arrangements you are making for my child and others who refuse PARCC. Printable written refusal cards for CPS students (7 per sheet): CPS told schools on 3.23.2016 that students could refuse in writing or verbally. BOYCOTT PARCC flyer (2-sheet): Opt out and demand resources! Let us know what is happening before and during the testing window at your school: Call (413)-3OPT-OUT or email info@morethanascorechicago.org or tweet @MTAS_chicago. We are happy to give support and advice to anyone running into difficulties with PARCC refusal. Expecting children to refuse high-stakes standardized testing themselves and ignoring parent/guardian wishes on this matter is wrong. We need an opt out law in Illinois. Learn more here about HB 306 the Opt Out Bill and call your state rep and senator to demand that they support it. Evanston Township board meeting. Discussion of problems with PARCC administration for high schools beginning at minute 47. Instead of petitioning ISBE or DOE, we should be petitioning our governor, state reps and state senators. If they write a law providing for parental opt out, our districts won’t have to suffer under the 95% rule. Yes, please call your state senator, Senate President John Cullerton and the governor about passing HB306, the opt out bill. It did pass the IL House last year, but is now stalled in the IL Senate. Please produce t shirts for children. The proceeds can be used to fund your organization and efforts. I would just love to repeatedly send my child to school wearing this shirt (having it made if I must) to make a point. Keep up the work. Dist.41 Glen Ellyn is revoking any parent and student requests to refuse students from taking the PARCC testing program. They are MANDATED to take these stupid and worthless tests. We are all TOLD if the student is absent or refuses to take the testing, they WILL have make up testing for them when they do return to school at any given day. Then Dist. 41 Glen Ellyn has called many parents with a voice recording stating ALL students MUST take these tests per state and governmental laws. If your child refuses or does not take these tests, the child could be in governmental law penalties. Are you telling them that they can’t do that? Does this also apply to the DLM? The Illinois alternative assessment for students with moderate to severe disabilities.